Editor’s Note: Nigel Jaffe (‘18) used robots to model organism behaviors in this lab report for his Scientific Research class where he worked in a lab at New York University. FIGURE 1 Side view of robot. Cable, sensors/breadboard, GPIO extension, and 7 Raspberry Pi power source excluded for clarity. 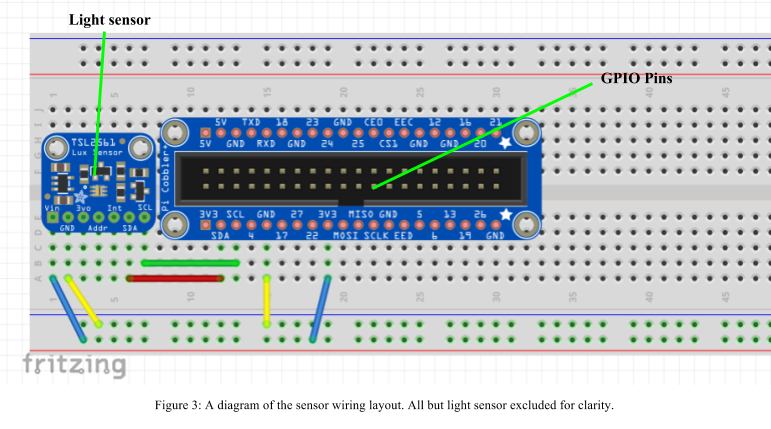 FIGURE 3 A diagram of the sensor wiring layout. All but light sensor excluded 9 for clarity. Complex relationships between sensory input and motor output define the decision making process in simple organisms. As such, the ability to understand and characterize those relationships is immensely important to behavioral science. Analyses of the simple behavioral patterns of the mobile larvae of Drosophila melanogaster, a common species of fruit fly, have lead to the creation of a mathematical model of their decision making process. These experiments are carried out by creating stimulant gradients in the environments of the larvae and then monitoring their motor responses to the gradual changes in their surroundings. Larval navigation patterns are determined using software-based mathematical analyses, formulating an algorithm that replicates behavior. Upon the characterization of these patterns, a robot was built which navigates almost exactly as the larvae do. This robot was assembled with proportional motor capabilities to those of the larvae, while small sensors were mounted on the top to act as receptors for various stimuli. Once an appropriately sized plane is constructed, a stimulant gradient can be created through which the robot will navigate as if it were a larva itself. The behavior of this robot can then be analyzed in place of the larvae, as the predefined algorithm will allow for substantive tests of the accuracy of the original characterization software. Small, simple organisms with little awareness of their surroundings determine the relative direction of favorable locations by analyzing sensory input provided by sources including but not limited to chemical, thermal, and photosensory stimulants (Dhariwal et al. 2004; Gershow et al. 2012; Kane et al. 2013). Studying the behavior of these organisms, in this case Drosophila melanogaster larvae, in controlled environments leads to the ability to define movement patterns based on relevant stimuli (Lahiri et al. 2011). The use of a novel tracking program and light system allows researchers to track individual larvae as they navigate through gradients of different light intensities (Kane et al. 2013). This has uncovered a set of relationships that let the larvae perform phototaxis, or movement based on visual stimuli (Klein et al. 2014; Luo et al. 2010). Drosophila larvae regulate several factors in their movement to produce the best possible sequence of motor responses as they navigate stimulant gradients (Lahiri et al. 2011). Pulsating peristalsis waves from head to tail drive forward movement, occurring in sporadic stretches, termed “runs” (Lahiri et al. 2011; Luo et al. 2010). Each cessation of forward movement is followed by lateral head sweeps, which measure the intensity of the stimulus so that a change in intensity can be recognized (Luo et al. 2010). This change in intensity determines each new direction the larvae will pursue, as reorientation maneuvers are then taken as needed, termed simply “turns” (Klein et al. 2014; Lahiri et al. 2011; Luo et al. 2010). The entire navigational system employed by the larvae can be reduced to these two motor programs: forward “runs” and lateral head sweeps which determine the direction of the subsequent “turns” (Klein et al. 2014; Luo et al. 2010). By tracking the muscles of the larvae over time as they navigate stimulant gradients, these distinct motor programs have been characterized effectively (Lahiri et al. 2011; Luo et al. 2010). Though the general defining patterns of larval navigation have been uncovered through behavioral analyses, the underlying neural and statistical model of larvae movement is still fairly vague. The general mathematical patterns present in their locomotion have been ascertained through the use of a software-based analysis of muscle positions over time (Luo et al. 2010). As this software presents the best method of characterizing the complex patterns of larval movement, its accuracy is paramount. Other approaches to testing the accuracy and precision of the analysis are still uncertain and near nonexistent, so finding a way to assess the current model is critical (Dhariwal et al. 2004). This larvae-based robot offers a solution to that problem. The navigational strategies it employs are very similar to those found in the larvae. They are complex and effective enough that the robot can successfully navigate a stimulant gradient as if it were a larvae itself, undergoing the same tests and experiments. However, unlike the actual larvae, the behavioral strategies used by the robot are already fully mapped and defined. Using the robot, it is possible to test the analysis software’s accuracy by using it to characterize the behavior of the robot instead of the larvae and then comparing its findings to the actual algorithm used by the robot. The purpose of this experiment was to use the robot to test the accuracy of the behavioral analysis software on a model whose behavioral algorithm was predefined. Robot Construction The robot is supported by a simple metal frame which makes up the chassis (see Figure 1). Two overhanging lips on each lateral side have notches through which two DC motors are fastened. The wires from these motors are run through small slits in the face of the chassis, then protruding through the top. Two wheels are affixed to the motors, giving the robot two-wheel driving capabilities. A third wheel with 360° turning ability is fastened at the frontward end, allowing for simple maneuverability. Resting on the face of the chassis is a Raspberry Pi microcontroller, which can interface remotely with a separate computer. A motor HAT (Hardware Attached on Top) is in turn rested on it, to which the motor wires are attached. The Raspberry Pi communicates with the motors through this HAT. On top of the HAT, a battery pack for the motors is secured. 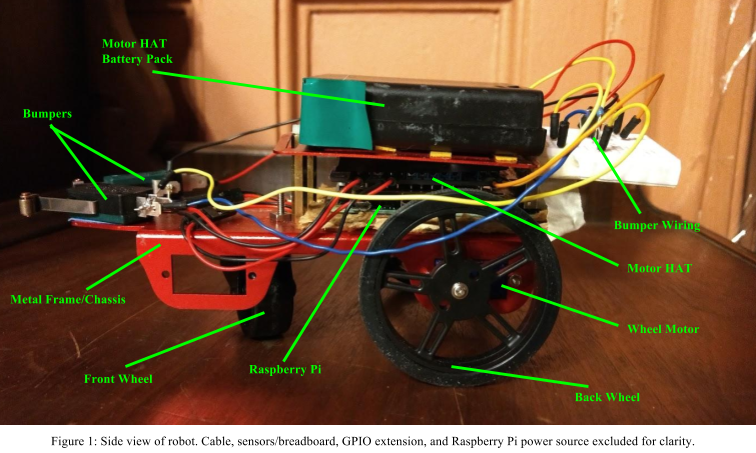 A GPIO (General Purpose Input/Output) ribbon extends from the HAT to a breadboard on the top of the chassis, aiding the attachment of physical hardware to the breadboard and allowing these components to report directly to the Raspberry Pi (see Figure 2). Upon the breadboard are the sensors necessary for each stimulus used in the experiments: photocells and more advanced lux sensors for light, a thermosensor for temperature, etc. 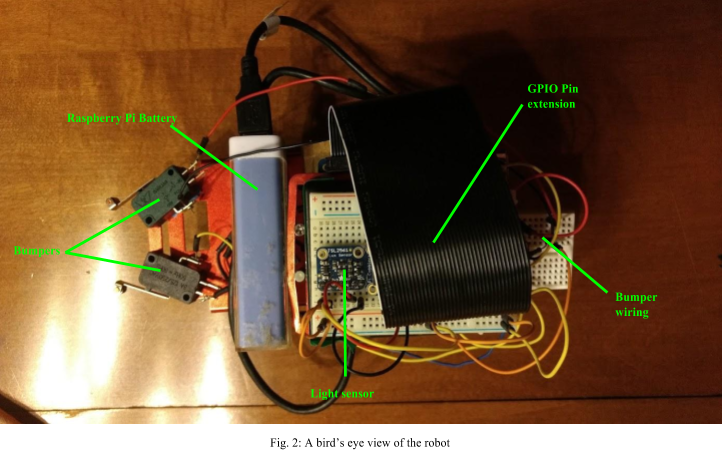 These are wired and connected to the appropriate GPIO pins, interfacing with the Raspberry Pi so that the robot can navigate based on the reported sensor readings (see Figure 3). Two microswitches are fastened at 45° angles to the two corners of the front of the robot. The power for the motors is run through these switches before reaching them, so that if the robot hits a wall, one or both of the switches is triggered and the connection to the motors is broken. This keeps the robot from continuing to attempt to move forward when blocked by an obstacle in that direction. Finally, a wire from the ceiling is attached at three points to the frame of the robot. The wire is then run through a pulley, a motorized spool, another pulley, a weighted pulley, and finally, an anchor. When the spool retracts the wire, the robot is lifted up and guided back to its starting position. The force on the wire from the weighted pulley keeps it from becoming slack and dragging behind the robot. A power cable is run along this wire so that a battery is not needed to power the robot. The Algorithm As larval locomotion is composed of two simple alternating motor programs, formulating an algorithm which replicates their navigational strategies is a relatively simple task. The most important strategy that the algorithm employs is phototaxis, or movement based on light. In this case, the robot’s goal is to navigate to the source of the stimulant. The robot is instructed to take a reading of its environment using the relevant sensor, and then make a run. After a stretch of continuous forward movement of about 20 cm, it takes another reading with that same sensor. The two readings are then compared— if the intensity of the stimulant is greater in the second reading than the first, the robot is making progress towards the source, and it is more likely to extend its run. If the intensity of the stimulant is lesser in the second reading than the first, the robot is not making progress towards the source, and it is more likely to engage in head sweeps and turn. The likelihood of turning based on the change in intensity of the light is such that the probability of turning is equal to: 11 + e-(-(5)-0.5) Where ∆ refers to the difference between the current and the last measurements of stimulus intensity, or the change in intensity since the last measurement was taken. The variables are adjusted according to the units used by the sensor to retain an appropriate range of likelihood— if, for example, a change of 50˚ celsius (when navigating a temperature gradient) constitutes a high likelihood of turning, but a change of 100 lux (when navigating a light gradient) does not constitute a high likelihood of turning, the algorithm must be adjusted to reflect that difference in its treatment of those units. The algorithm is encoded using the programming language Python on the Raspberry Pi. In general, this equation demonstrates that it is possible to perform the motor response that is less likely to be chosen in a given situation, regardless of the magnitude of the change in light. This effect is closer to the manner in which larvae actually operate— their choice of whether to run or turn based on the change in stimulus intensity is never fully predictable. Once the larvae runs or turns, it repeats the operation until it reaches the source. Upon reaching the source, a cable attached to the top of the robot lifts it and places it back at its starting position to repeat the entire experiment without human intervention. A camera records the results over a set time period, giving records of the navigational patterns employed by the robot and the amount of time taken to reach the source of the stimulus. As of the writing of this paper, the robot is complete and the algorithm effective. The robot is able to independently reach the source of stimuli using the navigational patterns incorporated into the algorithm, modeling the strategies employed by the Drosophila larvae. The sequence of runs followed by head sweeps and turns has proven effective in locating the source of a stimulant on a gradient plane. Experimentation of movement based on light is in progress, and has been successful thus far. The lux sensor used by the robot is sensitive enough to capture detailed readings of the intensity of the light, while the algorithm defining the likelihood of turning based on those readings guides the robot efficiently to the source. Records of the probability of turning based on the change in light compared to the action taken by the robot show that the assigned value of likelihood for each quantitative change in light intensity was appropriate, turning neither too frequently nor too rarely. Despite success in navigation based on light, a plane large enough to contain a sufficient gradient of other stimuli has not yet been established, so experimentation with sources is not yet possible. Temperature is extremely difficult to control, especially in larger spaces, so an advanced temperature gradient will need to be designed for the robot to navigate through before experiments using behavior based on temperature can begin. This mode of navigation is extremely common in Drosophila larvae, so it is especially important to model temperature gradients with the robot as well as light. Other stimuli, such as odor, are also difficult to control, and sensors to provide readings to the robot for these sources are not yet assembled. Once a gradient of gaseous stimuli has been established and the sensors set up, experimentation of this other form of navigation can also begin. Analyzing and Assessing the Robot’s Performance The main goal of the robot is to successfully perform phototaxis in a manner resembling that of the larvae themselves. It does not have to be perfect, or as efficient as the actual algorithm employed by the larvae, but it needs to be intricate and effective enough to work. This has been accomplished with the robot. The reason that this is so important is that an algorithm that can do this is complex enough to be analyzed. If the robot completes trials on stimulant gradients in the same way that the larvae do, its behavior can be characterized mathematically just as the larval behavior was. By analyzing this robot’s behavior, an algorithm can be developed based on mathematical analyses of the robot’s behavior. This new algorithm can be compared to the actual algorithm employed by the robot to give an idea of the accuracy of the analysis. An analysis of the larvae cannot be judged for its accuracy without the actual algorithm to compare it to. Unlike the larvae themselves, the behavioral algorithm used by the robot is completely known, so a comparison can be made. This is the greater purpose of the robot— to attain an idea of the accuracy of the analyses of the larval behavior. Once a proper gradient has been created through which the robot can navigate, data collection can begin. The only operational plane through which the robot can travel at the moment uses light, which is by far the easiest stimulus to measure and control. Navigation based on changes in light is simple and easy to predict, as the intensity of light from constant sources does not dissipate, unlike that of odor or temperature. Temperature or intensity of odor vary wildly over time based on factors such as movement of the atmosphere, while most light sources, especially in natural settings, change very slowly, not greatly impacting the behavior of organisms navigating based on them. This will make establishing and controlling a gradient of those other sources extremely difficult, but rewarding once successfully completed. The cable method for returning the robot to its starting position has only recently been implemented, and as such is still flawed. Other potential methods for returning the robot to its starting location have been discussed. They include having the robot retrace its path from the end back to the beginning. However, the robot’s slight lateral bias in forward movement may introduce interference, likely making this option nonviable. Depending on how long it takes the robot to reach the source, retracing its path could also take far too much time to be efficient. As larvae navigate a stimulant gradient, a camera records their movement and tracks their paths to the source. In experimentation on the robot, the same approach is used, with a camera recording its movement through the stimulant gradient. Analysis software uses the data collected from the larvae to formulate a behavioral algorithm. Using the data collected from the robot instead, this approach can be used to attempt to characterize the robot's navigational strategies. Unlike the larvae, the robot’s behavioral algorithm is completely known, as it was designed specifically for this purpose— thus, it is possible to compare the algorithm that the analysis suggests to the actual algorithm that the robot employs. This will give a concrete assessment of the accuracy and flaws of the analysis software through which the foundations of the original algorithm were derived, potentially leading to the revision of fundamental ideas about larvae behavior as the analysis is improved. I would like to thank all of the members of the Gershow Lab at the NYU Department of Physics for their patience, support, and willingness to help me learn. In particular, I would like to thank my mentor, Dr. Marc Gershow, for his amazing leadership, enthusiasm, and dedication to his work and to the incredible community of individuals with whom he works. He has had a profound influence on my work and will no doubt continue to foster learning and scientific advancement wherever he goes. I have had the immense pleasure of working with a number of wonderful people in my research, including Ruben Gepner, Mirna Mihovilovic, Jason Wolk, Scott Malley, and Doycho Karagyozov. Finally, I would like to thank my science research teachers, Erin Schmitz, Lutz Holzinger, and Tamara Machac for their incredible devotion to learning and to supporting the scientific community as a whole.